A mid-sized to large citrus fruit that is grown in several different variations, all similar in taste and aroma. The citron has a thick rough skin that provides a very bitter taste, typically considered unpalatable. When candied, the peel becomes translucent and attractive as a garnish or ingredient in marmalades and jams. It is also used in producing the liqueur, Cédratine. The citron skin is the most desired part of the fruit; however, the juice can be extracted and used like lemon juice, as a food flavoring. Citron can be a large oval shaped fruit 6 to 8 inches in diameter or irregularly shaped with finger protrusions, making it appear as an odd looking citrus fruit. 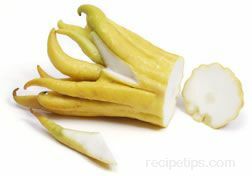 The Buddha's Hand citron is the exotic variety that grows in the shape of a hand with protruding fingers. This type is commonly grown for its aroma and for its thick peel that is often candied for use in fruitcakes and similar desserts.